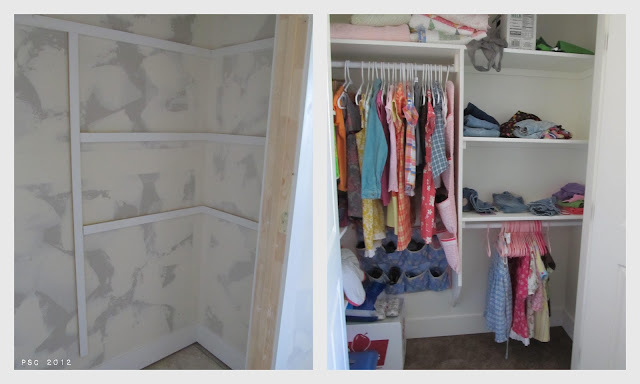 One of my favorite things in building our new home was designing our closets. 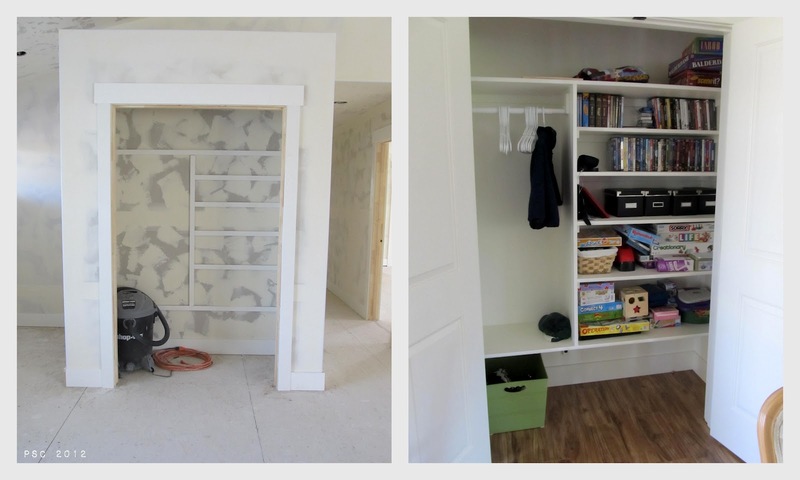 I thought I'd share a bit on how we built our closet shelving, and things I've learned after building our third house. Please note this is not a full tutorial, just our method for building shelving. First carefully consider what you'll be putting in your closets. How much hanging space or shelves will you need? What size clothing will be hanging? Do you want to store items in your closet that aren't needed often? Who will be primarily using the closet? How tall are the people using the closet? After thinking about things you want to store, draw out your idea on paper. Take measurements of the longest things you'll be hanging, and write that down. I actually measured how long our clothes hung from hangers. 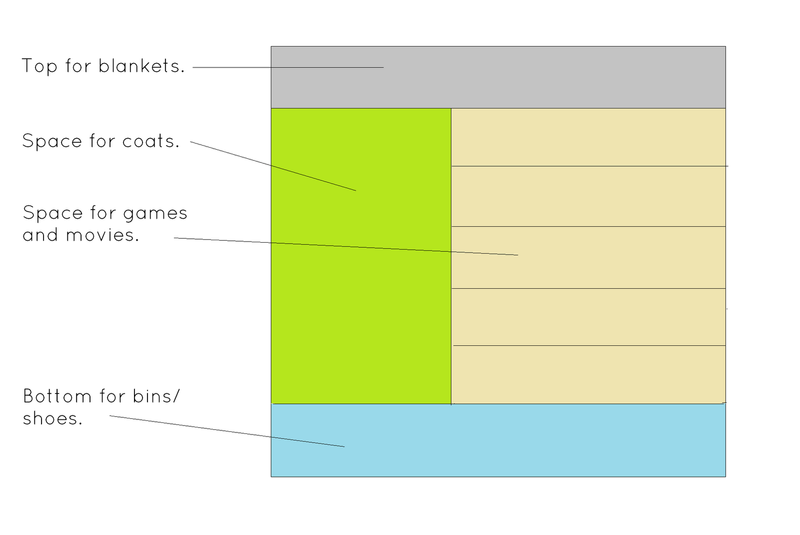 This is a diagram of our living room closet. I broke it down into zones, and then added the measurements later. 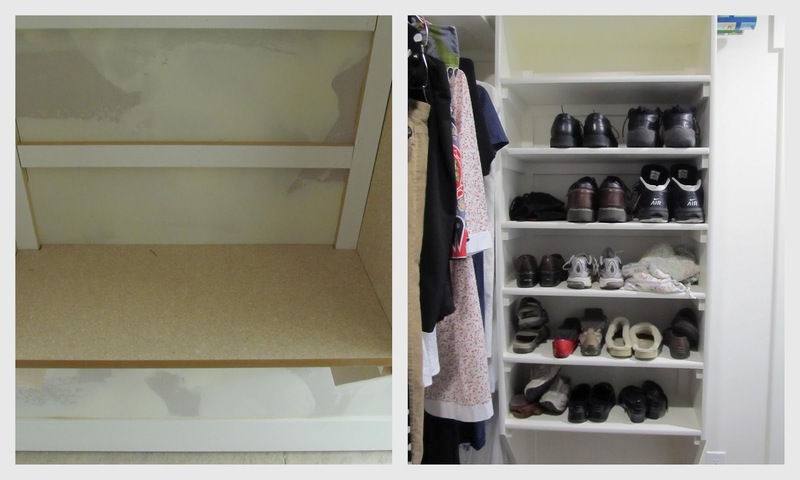 For our closets, we built our own shelves using fiberboard shelving and MDF 1x2 and 1x4 boards. Shelving for all seven closets in our home cost less than $500. You'll also need basic building tools. This includes a measuring tape, brad nailer, chop saw and skill saw, and a 4 ft level and 12" level. To build shelving is actually fairly simple. Step one. Draw your design on the walls using a pencil and level. This gives you a chance to refine your design, and see how it fits in the actual space. Step two. Attach your 1x2s or 1x4s to the wall, following your marks. Identify and mark where wall studs are. Cut your 1x2 to length you've chosen. Glue and nail to the wall, making sure to nail in the places where studs are. Nail with the longer 1.75" brad nails to be sure you reach the studs. Glue on the inside edge of your pencil marks. Step three. Add your vertical fiberboard pieces. To have shelves in the middle of a closet, you'll have to have vertical dividers to split up the space. These are fastened to the long vertical 1x4/1x2. Essentially, you glue along the inside edge of the vertical piece, and then nail from the outside of the fiberboard into the vertical 1x2/1x4. Please note our vertical dividers do not go all the way to the floor. Mr. Pickup and I learned to cut a diagonal at the end of the vertical sides to allow open floors. It takes a little more finishing, but it makes for easier vacuuming. Step four. Add additional 1x2 supports for inside shelves. Cut your 1x2s to the length you need, and then glue and nail in place. Use a level to make sure you are installing your shelving correctly. For the side supports that need to be nailed into the fiberboard vertical, change the nails to 1" brad nails so that you don't nail through the fiberboard. Although not pictured, you'll also need boards along both sides of the horizontal pieces you see. Step five. Cut horizontal shelving to length and install. These will also be attached with glue and small brad nails. These are especially critical for shelves as shown above that are hung between two vertical pieces, so that your shelves remain square and true. Please note, for our closet, we needed to use a jigsaw to cut out the back corners to fit around the 1x2s. Depending on your shelves, you may need to do the same. Repeat as needed to build your custom design. Step six. Add extra blocks for closet rods and hooks as desired. I cut 3x3" MDF blocks where we knew we would hang closet rods. I used a hanger to make sure I had them in the right place. I used longer scraps for hooks. This makes it easier to install these items without worrying about locating studs or having longer screws. Step seven. Finish the shelves as desired. Using spackle, fill all your nail holes. When dry, sand flush with the wood. Caulk along every seam. Then you're ready to prime and paint your shelves. I HIGHLY recommend using a semigloss paint to finish your shelving. It holds up so much better, and is easier to wash as needed. My part of our closet. Yes, I don't have very many clothes. This is the girls' closet. It's so nice to have a place for everything! The shelves we built to hold all our shoes. :) I'm so excited for no shoes on the floor! 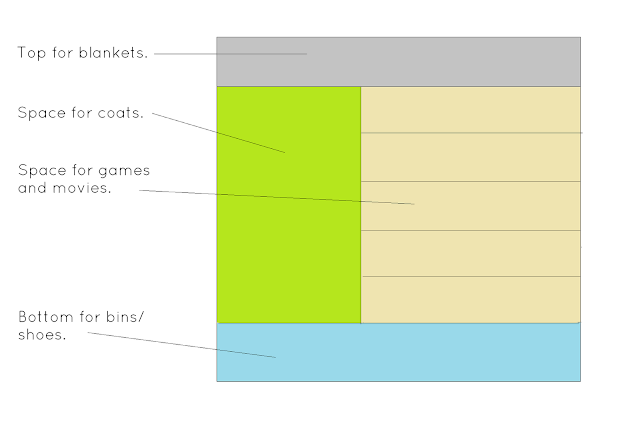 So, that is an overview of how we built our closets. I hope that helps you when building your own. If you have any questions, please leave them in the comment section below. Very cool! I know you are enjoying the fitted-to-your-own-specifications closets... it pays to think ahead! You know, I am glad, there are people who are good at math and really enjoy doing it. ;) Seeing the calculations makes me want to run the other direction. our home was built in 1912 and our closets are tiny to non-existent, I am so envious of your wardrobes. It must make you so happy to have a place for everything. Ooooh, nice! And what a luxury to be able to design your very own wardrobes!! Thanks for sharing this very helpful information!! 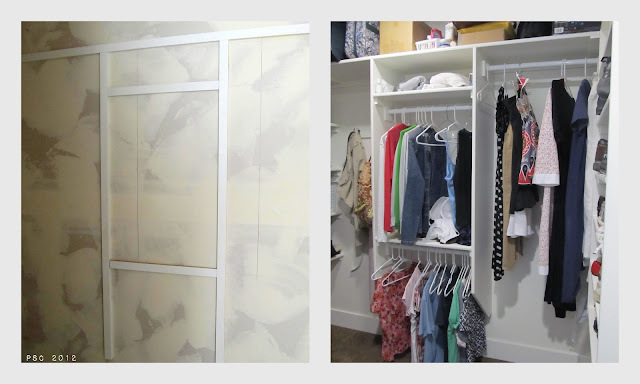 We are inspired to do one of our closets from this! I was wondering which white paint you used and if it is the same color as the trim in the rest of your house. Also do you recommend painting the inside of closet and shelving pieces first or painting all of it after it is put together? What kind of paint did you end up using for both the primer and finish coat? Oil or latex? I've tried both on MDF; oil-based in the pantry and latex for the linen. While the oil-based looks better and feels like it has a harder shell, it definately has a strong odor that even after 3-4 weeks has yet to go away and makes oil-based not a great choice for the closets I'm about to build in all the bedrooms. Latex or oil? Really thankful for putting the information out and making me believe that I too can build this one.